Wintergreen couch is a soft fine to medium leaf grass and has a luscious soft to the touch fine leaf cover. Ideal for areas that are subject heavy use or in full sun. Wintergreen is very robust and exhibits rapid recovery after damage or high wear. Winter green establishes easily with minimal maintenance, and low water consumption. 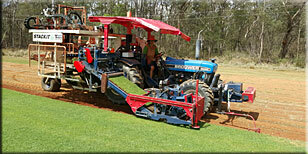 For more info phone Troy ph 0405 649012 Need a turf Prep. We also offer bobcat hire and turf Laying service. Need a turfprep. We have our own equipment at Arcadia. Min. Charge 2.5hrs We can help with- -Turf preps We can supply and install soil. -Installing Gravel, Bobcat, gravel and matting. -Spreading Mulch. Barks, composts and wood chips, For schools, homes or commercial buildings. - Installing Roadbase. We have a new vibrating drum roller for this. Driveways or Carparks. -Rubbish clear up and gardens removal. This couch is ideal for people that want less work. Its dark green witha lower growth habit. Yes it still has a seed head. Very hard wearing. Great for pets and kids. Tifway419 - World leading choice for Golf greens and tees. This is a superfine leaf. Makes a great playing surface. It has all the same features as Tifdwarf, but also has a very rapid growth pattern. This makes it perfect for high wear playing fields, such as Rugby ovals. Having such rapid growth means it repairs very quickly. Excellent growth in sandy conditions. Tifway419 has the ability to handle low mowing heights. 2-4mm Blade Width Phone Today for quote. The ultimate in reinforced turf. Comes in 2 metre wide living Mat. Ideal for high flow drains. Phone today for a quote for your next project. Turf laying on a prepare site with fork access. Discounts apply for large projects. For 50 to 50000 we can help. Also Need a bobcat or soil. Phone Troy for more on ph 0405 649012 Our min. laying charge is $250.